Today the Obama administration issued a statement calling for a ‘First Job’ funding initiative to connect young Americans with jobs. “After the worst economic crisis of our lifetimes, the United States is in the midst of the longest streak of private-sector job growth in our history, with more than 14 million new jobs created during the past 70 months. But for too many young people, getting a first job—a crucial step in starting their career—is challenging. I brought up this same issue 3 months ago in a previous blog post that highlighted the differences in teenage unemployment across cities. And unsurprisingly there are substantial differences – in 2012 teenage unemployment was over 45% in Atlanta and only about 26% in Houston. So what’s the proposal? A $5.5 BILLION grab bag of grants, skills investment, and direct wage payments to put young people to work. Naturally, the most obvious solution to the teenage unemployment problem is never mentioned – eliminating the minimum wage. In fact, nowhere is it hinted at that the minimum wage may be contributing to teenage unemployment, despite several recent studies affirming this theory. This glaring omission is unconscionable in light of the abundant evidence that the minimum wage harms the least skilled, least experienced workers, which includes teenagers. An all too common occurrence in US policy is that government intervention causes a problem that the government then tries to solve with additional intervention, completely ignoring the possibility that the initial intervention was the source of the problem. In this case, price controls at the bottom of the labor-market ladder have prevented young people from getting on the first rung, so now the government wants to wheel over a $5.5 billion dollar stool to give them a boost. While this series of imprudent events is not surprising, it’s still frustrating. This entry was posted in Economic Policy, Minimum Wage, Unemployment and tagged boost, David Neumark, First Job, growth, United States, US, WSJ on February 4, 2016 by Adam Millsap. Nothing is free from the threat of political favoritism. Not even the holidays. And, as it turns out, Thanksgiving actually fell prey to it for a few years under Franklin Delano Roosevelt. But first, a bit of Thanksgiving History. At the request of the first Federal Congress, President Washington issued a proclamation naming Thursday, November 26, 1789 as a “Day of Publick Thanksgivin [sic].” Subsequent presidents followed Washington by issuing their own Thanksgiving Proclamations. However, the dates and months of the proclamations varied. Eventually, under Abraham Lincoln, Thanksgiving was set to be regularly commemorated each year on the last Thursday of November. In 1939, the last Thursday in November fell on the last day of the month. As a result, President Franklin D. Roosevelt issued a Presidential Proclamation moving Thanksgiving to the second to last Thursday of November. Why did Roosevelt see the need to move Thanksgiving? Hopkins told Roosevelt anyway, and the president, sensitive to the needs of business, moved the date of the holiday. [W]e have waited years for a late Thanksgiving to give us an advantage over the large stores, and we are sadly disappointed at your action, in this matter. Kindly reconsider and oblige thousands of small retail storekeepers throughout this country. Ultimately, 32 states issued proclamations moving Thanksgiving to the second to last Thursday, while 16 states refused to change and proclaimed Thanksgiving to be the last Thursday in November. For two years, the United States had two Thanksgivings. The President and part of the country celebrated it on the second to last Thursday in November. The rest of the country celebrated it a week later. After two years, and four Thanksgivings, Congress put an end to the confusion by setting a fixed date for the holiday. In 1941, the House of Representatives passed a resolution declaring “the last” Thursday of November to be Thanksgiving Day. The Senate amended the resolution to read that it be celebrated on “the fourth” Thursday, to take into account those years when there are five Thursdays in November. On December 26, 1941, Roosevelt signed the resolution, thereby establishing the modern Thanksgiving Holiday. Did Roosevelt’s “Franksgiving” experiment work? Not exactly. Stein and Delaney write that the Commerce Department found that expected expansion of retail sales never occurred. 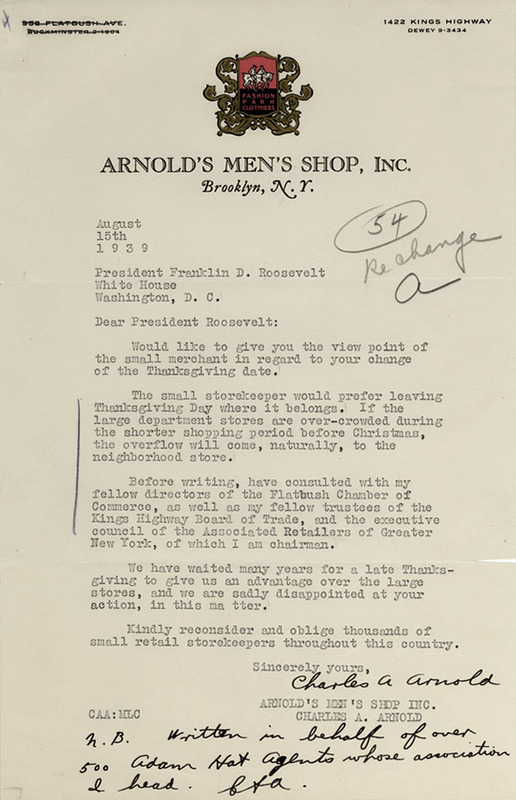 In the end, they note, Roosevelt conceded that the economic benefits of moving Thanksgiving had not been worth the struggle. Enjoy your Thanksgiving turkey. Just think, at one you time, you could’ve done it twice. This entry was posted in Government-Granted Privilege, Study of American Capitalism and tagged Abraham Lincoln, Commerce Department, Congress, Federal Congress, Franklin Delano Roosevelt, Lew Hahn, President Washington, Presidential Proclamation, Retail Dry Goods Association, Thanksgiving History, Thanksgiving Holiday, Thanksgiving Proclamations, United States, Washington on November 27, 2013 by Christopher Koopman. Should Regulation Prohibit Self-Penalizing Behavior? Last weekend, a guy ordered the “Sourtoe Cocktail” at a hotel bar in Dawson City in the Yukon. The drink is garnished with a real (preserved) human toe. The patron downed the drink, deliberately swallowed the toe, then paid the bar a $500 fine for swallowing the toe. This is the kind of anecdote that would prompt health and safety advocates in that less-civilized country south of the border (the United States) to call for a new regulation — probably one prohibiting the use of human body parts in cocktails. In my humble opinion, the story is a good example of why it’s a waste of government’s time to regulate against behavior that carries its own penalty. That double-whammy already ensures that swallowing a toe in one’s drink will be a rare occurrence. Yet there is still some risk that it will happen again; a precautionary approach would suggest that a new regulation is indeed needed unless the drink can be proven absolutely safe. The tale of the Sourtoe Cocktail is a fanciful (but real) example of self-penalizing behavior that is (apparently) not yet prohibited by the Canadian government. The U.S. government, however, has seen fit to enact regulations prohibiting much more mundane behavior that carries its own penalty. For example, consider energy efficiency standards for appliances used by consumers and businesses. These standards effectively ban the sale of appliances that cost more to operate because they use more electricity or gas. Energy efficiency can have environmental benefits, but in many cases, most of the benefits the government claims for energy efficiency standards come in the form of lower energy bills for the users. In other words, the decision to buy a less-efficient washing machine, furnace, or refrigerator carries its own penalty in the form of higher energy costs. The Department of Energy’s proferred justification for these regulations is that consumers harm themselves by placing too low a value on the future energy savings. That’s a debatable point that Ted Gayer and Kip Viscusi have amply dealt with in a recent study supported by the Mercatus Cetner and published in the Journal of Regulatory Economics. My colleague Sherzod Abdukadirov listed a bunch of regulations that employ similar logic in his recent post. Even more questionable is the regulation regarding commercial washing machines that I reviewed for the Mercatus Regulatory Report Card. The Notice of Proposed Rulemaking for this regulation seriously argued that greedy, profit-oriented businesses would leave money on the table by refusing to invest in cost-saving, energy-efficient washing machines that would generate a high rate of return due to the energy savings! With all the ways people find to harm each other, do we really need regulators to police behavior that carries its own penalty? This entry was posted in Regulation and tagged cocktails, energy, Energy Efficiency, Mercatus Cetner, Mercatus Regulatory Report Card, regulation, Sherzod Abdukadirov, Sourtoe Cocktail, standards, United States on August 30, 2013 by Admin Admin.